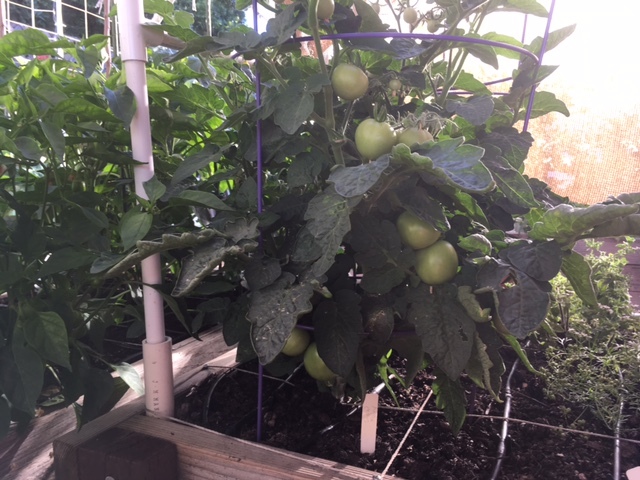 Congratulations on growing some nice looking Tomatoes this year. Lets all hold our breath to make sure they continue to remain disease free. @sanderson wrote: Thanks, folks. I am so hopeful, but there are still 3 brutal months ahead. I'm right there with you, Sanderson. Everything looks so good right now, but those triple-digits are looming. @yolos wrote: Congratulations on growing some nice looking Tomatoes this year. Lets all hold our breath to make sure they continue to remain disease free. Thanks, Yolos. The big plan is to can enough for 2 winters, as I can't count on next summer. My canned tomatoes and frozen sauce from 2015 were outstanding. 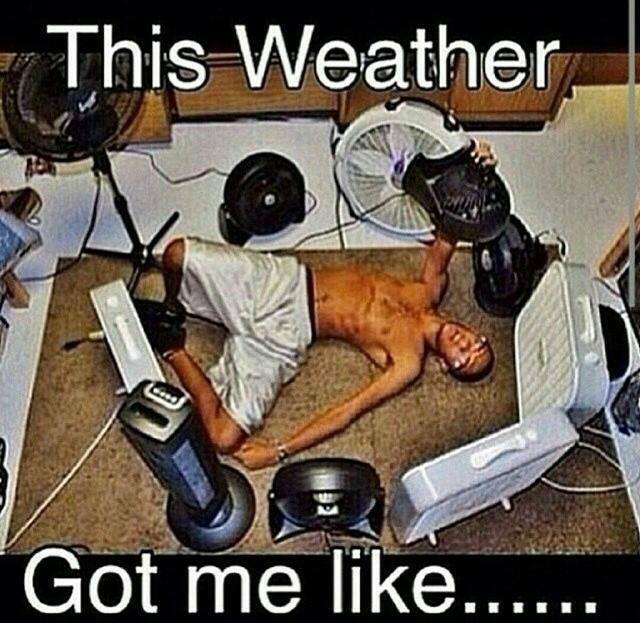 Heat Wave coming! Sunday through next Friday 105-110*F expected. Get those shade cloths up! 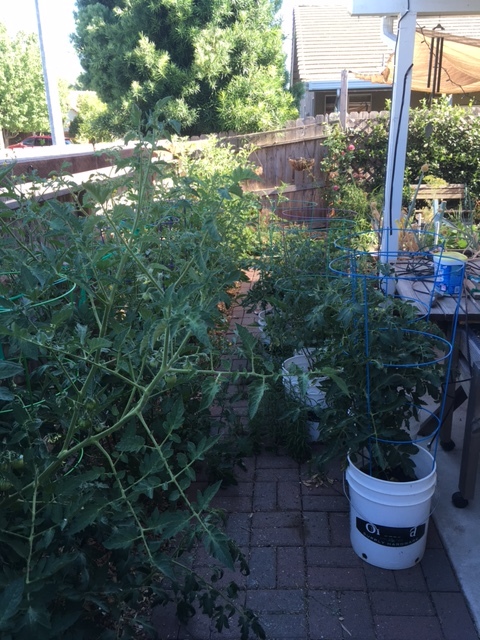 I have about 200 tomatoes set, both cherry types and indeterminates. A lot of cherry-sized peppers and a couple of eggplants have set. I don't expect any more setting until the temps get back down closer to 90*F. For the next days/weeks, it will just be a struggle for the plants to survive. Bush Blue Lake are producing nicely but they are hard to see. Muncher cucumbers are producing nicely without any help from me. A lot of female flowers appearing on the cantaloupes and winter squash. 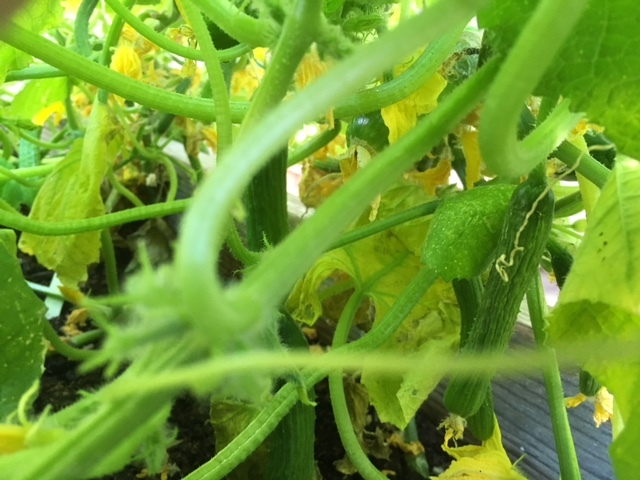 No flowering males on the winter squash so the females are just "withering on the vine." Oh, the poppy seed poppies are blooming. The flowers are white for this variety so if I want color next summer, I will have to get a variety knowm for it's flowers, and not the bakery seeds. That's all for now. If I take any photos, I'll post them later. Sounds VERY successful in your little garden this year, Sanderson! Lots going on very quickly. Looking forward to the photos. Today is 99*F, the last "cool" day before we enter the 100's for at least 9 days. Tomato - Snow Fairy. This would be a great one for containers and winter green house. The photo was taken facing west into the setting sun with Home Depot shade cloth as the back drop. 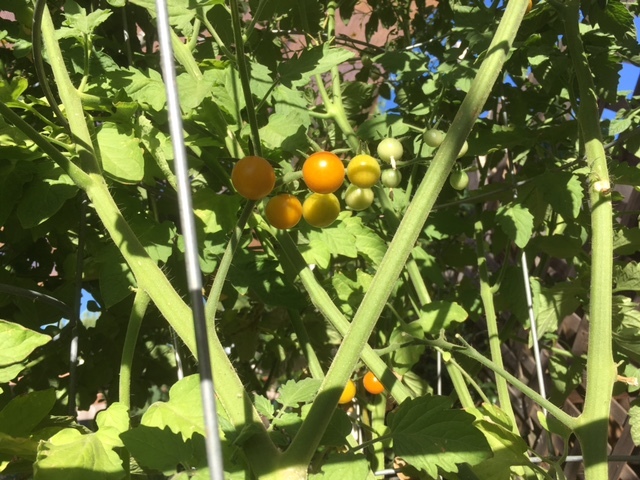 Tomato - sun gold. I have this one in a 2' x 3' table top with one Roma and one Sweet 100. In the last photo one can see that they are touching the overhead shade cloth. Tomato Vernissage with several clusters. The Vernissage in the table top has an interesting "worm" that burrows into the tomato under the green leaf thingies (?) where it attaches to its stem. Not green, but yellowish. I have seen the white butterfly around but her caterpillars are green. Two photos of Muncher cucumbers. 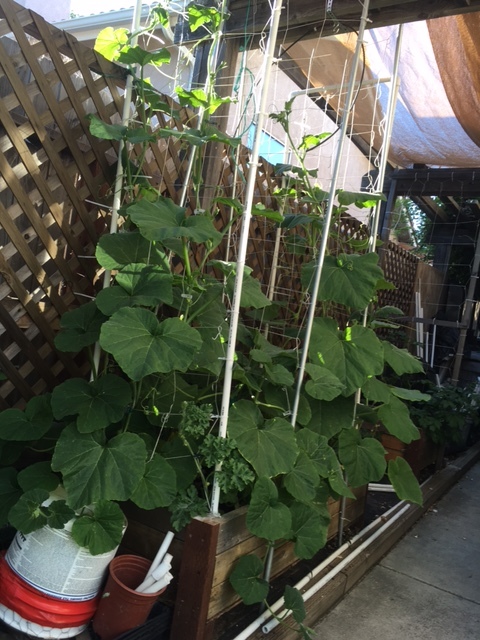 I never installed the middle trellis for the box but maybe being crowded has turn out for the best as there are more cucumbers in these photos than I have had for a whole season some years. Shade cloth off the back patio. No, I still haven't cleaned the isle and spread weed fabric and wood chips. 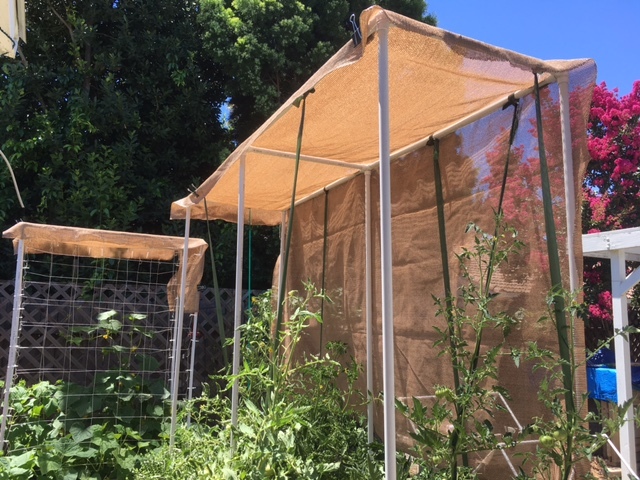 Winter squash and one watermelon now under mid-day shade cloth. 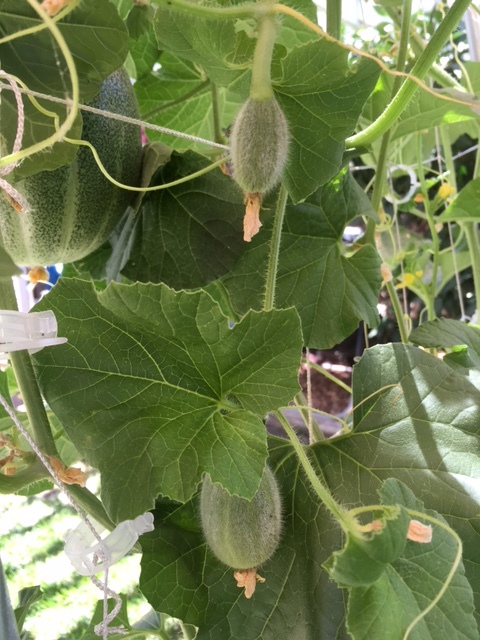 The little watermelon has its first flower. Note: Direct seedling late has been paying off! So far, no powdery mildew. Lastly, the 1' x 50' dirt strip that I amended over the last 2 years is really paying off. 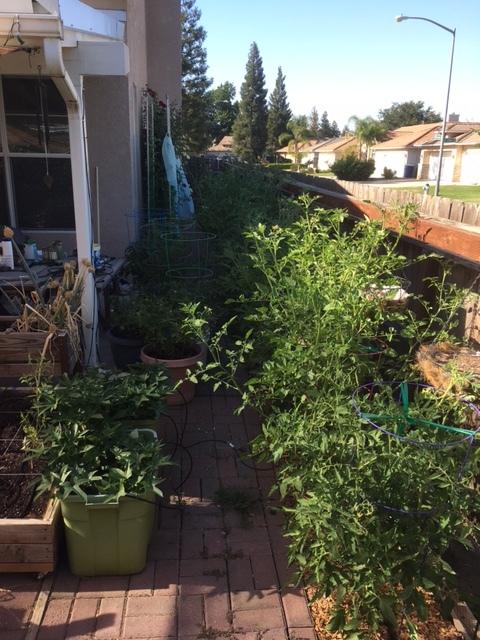 I call this first one "tomato jungle" as I can't walk through the 9 tomatoes on the left and the 5 tomatoes in buckets on the right. Photo of jungle from the other side. I'm standing 6" higher than the jungle's elevation so you can see all the way down to the corn. 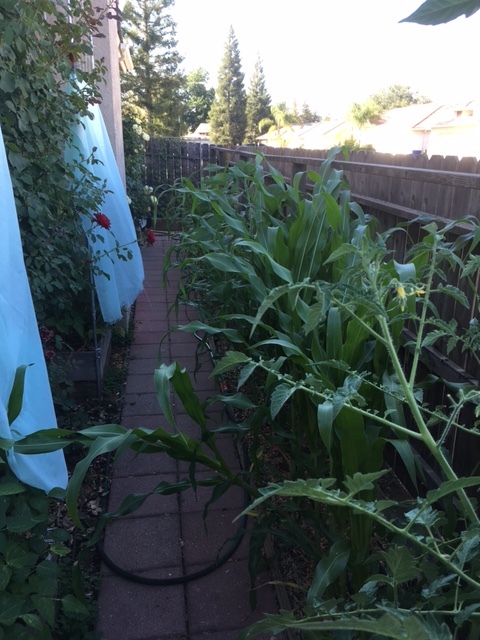 Corn, sorghum, okra and sunflower row. Some of the corn is peeping over the fence so it is shy of 5 feet tall. @sanderson wrote: Today is 99*F, the last "cool" day before we enter the 100's for at least 9 days. Yikes! That's too hot for me. I went outside this morning at 8:30 and installed 2 more smaller shade cloths. I was dripping after just a few moments. 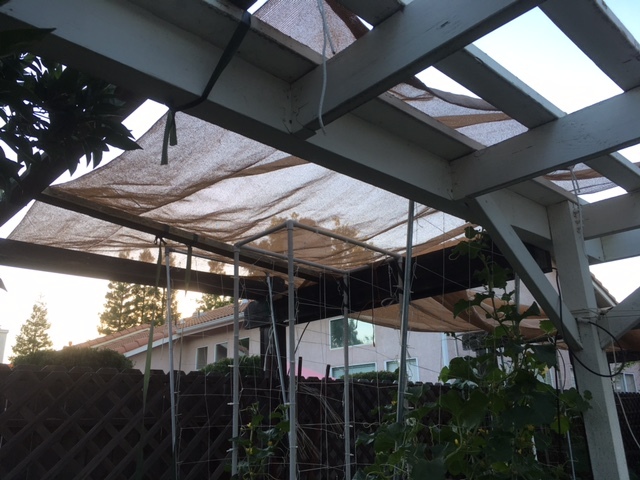 Yesterday evening at sunset, I finally installed a shade cloth I worked on for 2 days, hemming by hand and making holes for tie downs. It is over the cantaloupe and New Zealand spinach beds. I hand pollinated this Canadian Crookneck butternut yesterday morning, and I believe it was a take. Thank goodness there were 2 male flowers at their peak. 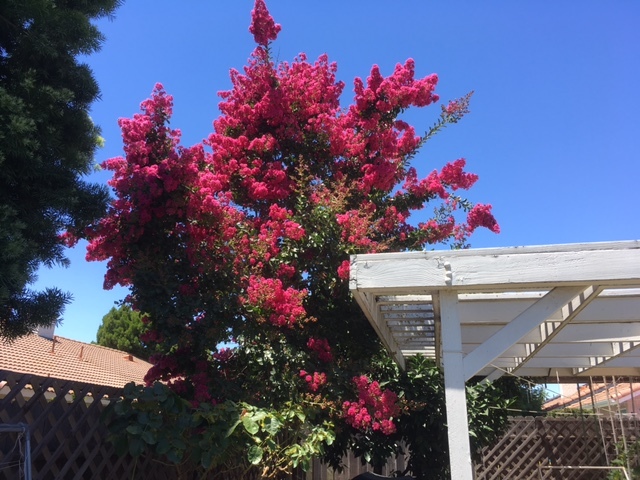 Lastly, the crepe Myrtle is blooming profusely, I believe from all the rain we had this spring. Sanderson, everything looks great. Impressive. Great imagination. 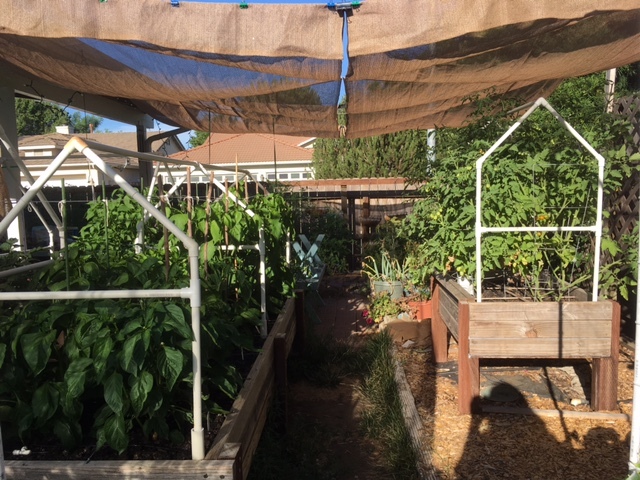 Have you considered using snap clamps for fastening the shade cloth to the PVC? What are we doing? Sweating, panting, guzzling fluids, turning the hose on ourselves, hiding in the a/c, worrying about blackouts if we overload the system, hovering over plants that might suffer in this heat, watering down the chicken coop at bedtime to help make things bearable for our feathered friends, dreading our next water bill (this one already broke $100), and watching the weather reports as we shatter the previous heat records every day -- Thursday it could reach 114 here. Finally below 100 here, well, at least until July 6. I finally got some straw mulch down in 5 beds,4 more to go. 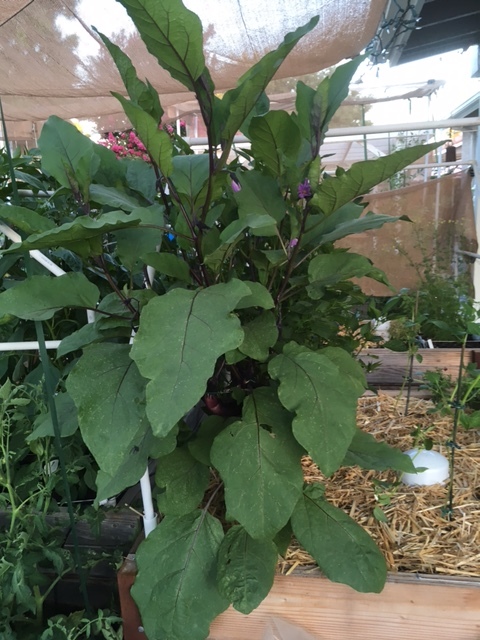 You can see it here where this wonderful 4' tall Japanese Millionaire eggplant is thriving. Two nice cantaloupes from the single surviving start. 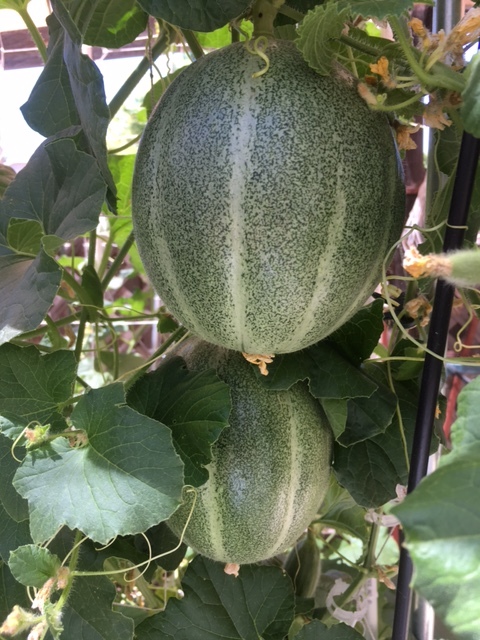 Twp baby cantaloupes from direct sowed seeds. The potatoes have been eaten by something. I recently sprinkled some Sluggo Plus to see if it was slugs. This bed is on the hot side on the house and gets neglected more than loved, so it's my fault. I washed, trimmed and froze a short gallon of various tomatoes for future sauce. When I get a good flush of some of the larger tomatoes, I'll prep them for canning. I don't mind a few Sun Gold but I want more of the reds for canning. Romas. The pole Blue Lakes are toast and I will pull them. Likewise the bush Blue Lakes are dying. I don't know what is eating the leaves. Maybe spider mites?? 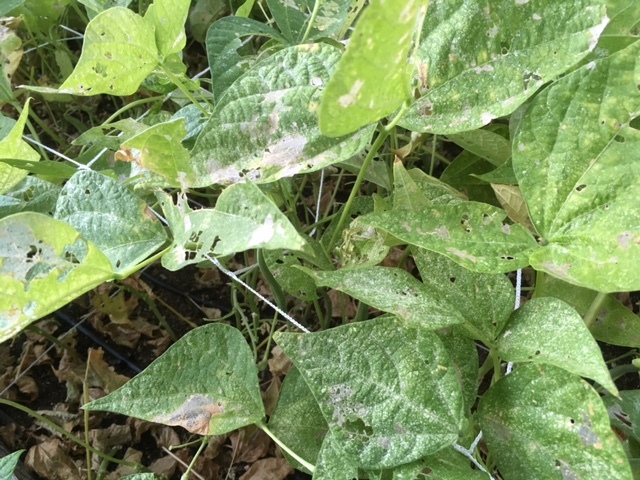 Spider mites take over when it gets over 100*F. I picked all the beans and pulled them tonight. If Yolos gives the go ahead, I will amend and replant again tomorrow. Ha, I don't know. My policy is to never plant a succession in the same bed. Especially if you have a disease or something like spider mites. (Looks like sprider mites and something larger). But I do have more square feet than you do. Also, for the first time I planted a second planting of corn in the same bed but there were no disease or insect pressures to worry about. PS - your eggplant is gorgeous. it looks like leaf miners and flea beetles. Here, everything is alive and well, but not growing or producing. It all looks exactly like it did 2 weeks ago. Yay on your tomatoes, Sanderson! When I canned them in the past I loved the flavor of mixing varieties. Looks like there are lots of good things growing in your garden, Sanderson. those cantaloupes look impressive. loved the look on the tomatoes. Thanks, folks. Still chopping straw for the tumbler composter. But, the big event of the day was locating and putting a baby mocking bird back in its nest. Mom and Dad built the nest in a climbing rose bush, which was pretty smart. They hardly tolerate me, keeping watch and feeding the babies when I turn my back. Today, they were in a tizzy all day long. I got to thinking that a rogue MB attacked the nest, maybe knocked the babies out. ?? Sure enough, just before we left home for the evening, I echo-located a baby 20 feet away. Baby screaming, parents squawking, I put the guy back in the nest. Tomorrow I'll look at the nest with a mirror and see if there are 2 babies. I never answered your prior question. I use binder clips instead of snap clamps. do you have a picture of the binders clips you use? @countrynaturals wrote: Here, everything is alive and well, but not growing or producing. It all looks exactly like it did 2 weeks ago. I wrote this after visiting the BTE, where I planted most of the summer crops. When I went to the Salad Bar, it was a whole different story. Kale, asparagus beans, carrots, and Swiss chard are doing great. This morning, something woke me up before the sun. I was outside as soon as it was light. It was great to have all the time I wanted before it got hot. I found a beautiful batch of compost, thanks to the chickens, and used it to top-dress the corn and tomatoes. I also got all my watering done, and checked on everything. Some of the passion fruit has turned bright orange and getting squishy. All of my late-started Armenian cukes have sprouted. 3 more strawberries are starting to turn red (Time to put their "socks" on.) LIFE IS GOOD! Sorghum is up and happy (direct sow BTE). Cowpeas have sprouted (Jiffy Pellets on the deck). They'll go into the Salad Bar in a couple of days (large containers). I couldn't find sweet potato slips, so I put a whole sweet potato in a cup of water. It grew roots in just a couple of days. I read that it should take about a month for it to produce slips I can plant. I know it's a little late, but could we still get some for Thanksgiving? 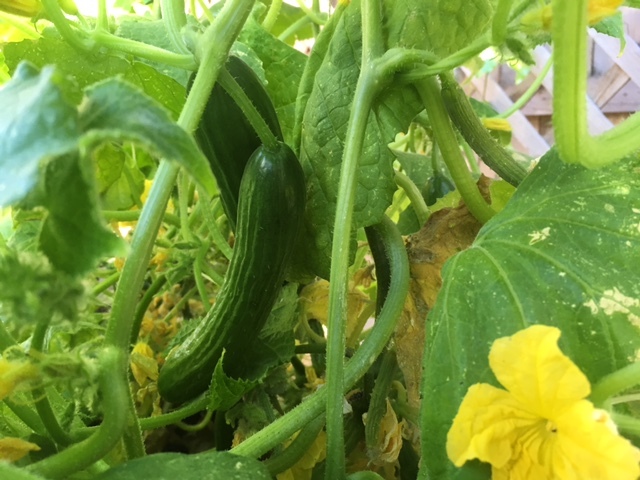 Armenian cukes are up and happy, but also late, so we won't be eating those for a while. I'm actually getting a few tomato blossoms, even through these continuing heatwaves (if they produce, I'll collect seeds from those hardy babies). 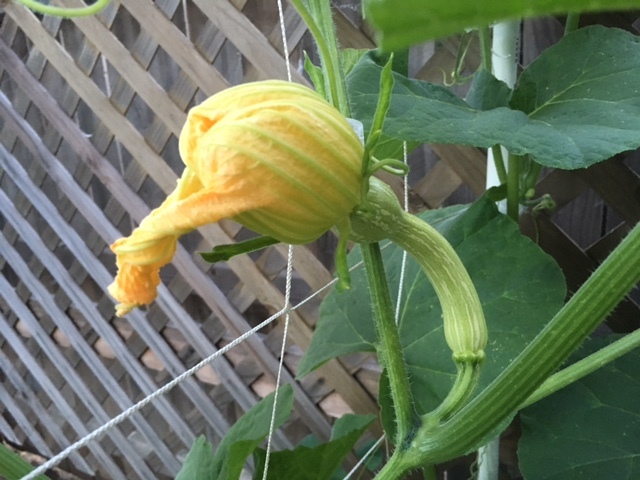 None of my melons, squash, cukes, or zukes are producing any female flowers. I'm thinking it's a defense mechanism against the heat. They can't fight that and produce fruit at the same time. Hopefully I'll get a late crop and have the whole winter to research more heat-tolerant varieties of everything. Kale is still happy. I'm planting more. (Curly dwarf). 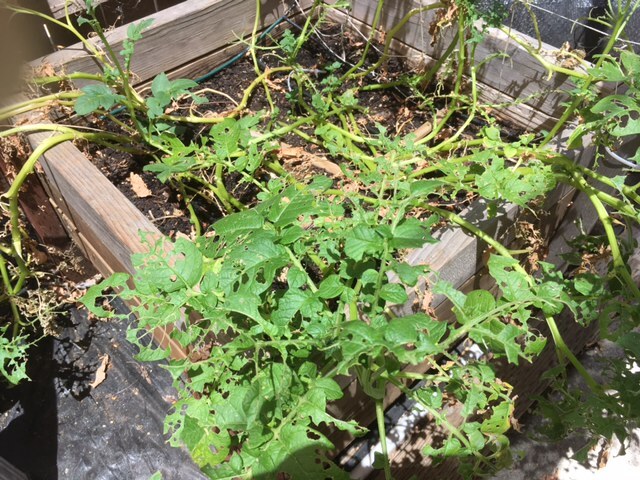 The heat wave we've experienced over the last few days is beginning to ease a bit, but the damage is evident in my scorched bean patch- all the new shoots have withered and also, the zucchini are drooping every afternoon, and slow to flower. 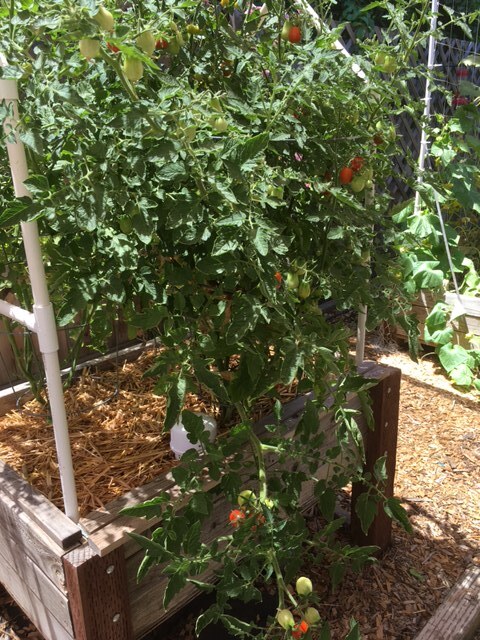 The tomatoes aren't setting any fruit, but the fruit that has set seems to be doing OK. I'm hoping this summer I can keep up on the watering, because our water prices have jumped to the highest in the nation- (probably the Western Hemisphere too). 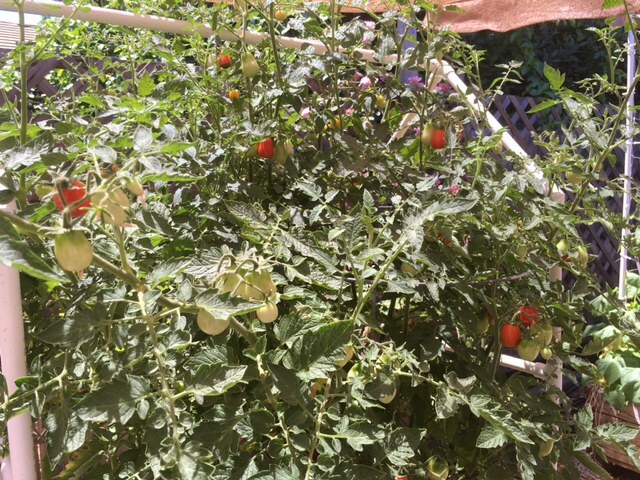 @Yardslave wrote: I'm hoping this summer I can keep up on the watering, because our water prices have jumped to the highest in the nation- (probably the Western Hemisphere too). YIKES! Mulch! Mulch! Mulch! Mulch! I know our water bill will be at least double what we paid last year, but we don't have any other expensive habits, so we'll just call it "entertainment." 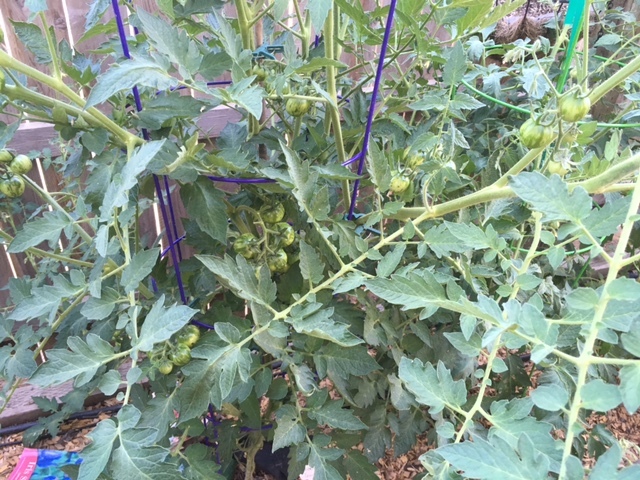 I actually have a tomato plant producing blossoms in this heat. I don't know the variety, but if it continues to thrive in this weather, I will definitely collect seeds for next year.